One of the great features of the Z1 Analyzer is its ability to show you live telemetry. This allows you to see the data streaming off the car in real time. If you are a driving coach this lets you give real time feedback as opposed to having to wait for the lap to be finished before helping your driver. In addition if you are a team manager then you can use this feature to monitor your car to make sure everything is within appropriate values. The Live Telemetry settings screen allows you to set up how the Analyzer will connect to some of the sims, as well as specifying some of the display features for live playback. If you are running the Z1 Dashboard on a different computer from the sim and want to connect to the Z1 Server software, then you should enter the IP address being used by the Z1 Server software here. If you are running the Z1 Dashboard on a different computer from the sim and want to connect to the Z1 Server software, then you should enter the port number being used by the Z1 Server software here. If you want the Z1 Dashboard to try and connect to the Z1 Server you should tick this checkbox. Leaving it unchecked will prevent the Dashboard from searching for the Server, and slightly speed up the connection to other sims. 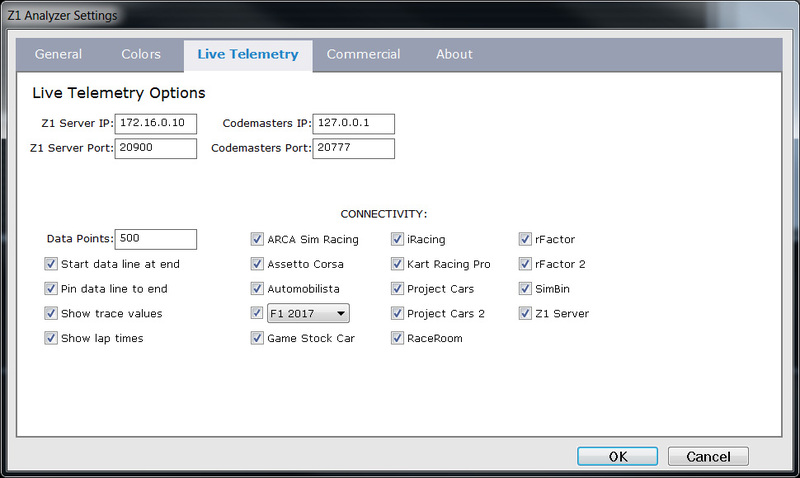 If you want to connect to the Codemasters F1 sims 2012 - 2013, then you should enter the IP address being used by the Codemasters sim here. This is usually 127.0.0.1. If you want to connect to the Codemasters F1 sims 2012 - 2013, then you should enter the port being used by the Codemasters sim here. This is usually 20777. The various connectivity options determine which sims the Z1 Dashboard will attempt to connect to. If you are only using a few sims then unchecking the ones which are not used will result in a faster connection time when starting your sim. This is the number of individual data points kept in memory. The higher this number the farther back each trace will display data. A smaller number will move the data across the screen faster. With this checked the data line that shows the current location of the displayed data numbers in a trace will begin at the end (the right side) of the traces. With this checked the data line will stay at the right side of the trace regardless of where you click while live telemetry is playing. With this checked the telemetry values will be displayed at the data line during live telemetry playback. If these numbers are interfering with your view pof the trace lines, then uncheck this box. check this box if you want the current and last lap time to be displayed on the track map when live telemetry is running.